Global Economy Matters: The German Economy Is Essentially "Intact"
The German Economy Is Essentially "Intact"
According to Bundesbank President Axel Weber, Germany’s economic recovery is “essentially intact”, and is now set to benefit from stronger demand in countries outside the euro region. What exactly it means to say that an economy is intact we will explore below, but it is clear that some confirmation for the view that the German economy is benefiting from increased demand originating outside the Eurozone can be found in the latest press release on manufacturing industry turnover from the Federal Statistics Office, where they note that while January's manufacturing sector turnover surpassed that of January 2009 – by a working day adjusted 2.6% - domestic sales actually fell (by 1.1%), and export turnover rose by 7.3%. Most interestingly, as between destinations, sales to euro area countries only increased by 2.4%, while those to other foreign countries were up 12.0%. This illustrates two points: that the German economy is now more dependent than ever on exports, and that sales to emerging markets are what is really driving export growth at this point. 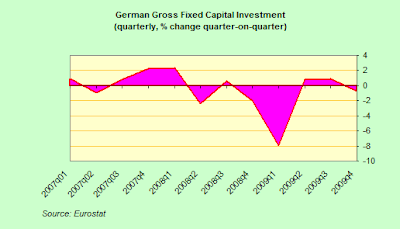 This latter development is hardly surprising given the strong fiscal corrections being applied in many of Germany's former customer countries. 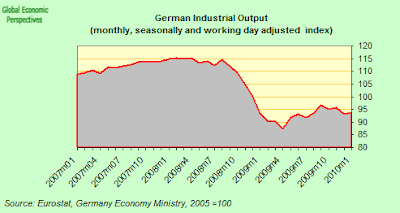 In fact, while German industry is surely now in "recovery mode", the process is something of a stop-start one (see chart below), since even though according to the latest data from the technology ministry output was up by an estimated 0.6% in January over December (and even up by 2.2% over the very low level hit in January last year) it is still down by 18.5% over the March 2008 peak. 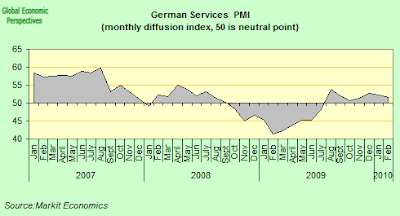 Still the story of the German economy remains very much one of a tale of two components, with net trade offering some relief to pretty negative domestic demand data. 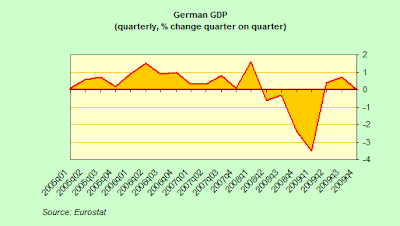 According to the Federal Statistical Office, German gross domestic product stagnated in the fourth quarter of 2009, remaining unchanged from the level of the previous quarter level(0.0% change). 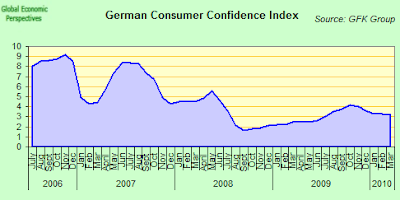 Thus the slight upward trend noted during the second (+0.4%) and third quarters of 2009 (+0.7%) did not continue. GDP from October to December was down by 1.7% on a year earlier. 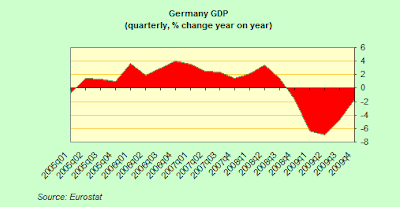 The decrease, which was smaller than in the previous quarters of 2009 still meant that German GDP fell by 5% in 2009 as a whole when compared with 2008. Economic growth in the fourth quarter of 2009 was, in fact, only really supported by foreign trade: exports rose 3.0% on the previous quarter, while imports decreased 1.8%. The resulting balance of exports and imports contributed 2.0 percentage points to GDP growth. That positive contribution was, however, entirely offset by a fall of 2 percentage points in total domestic demand (including inventory movements). Both household consumption expenditure and gross fixed capital formation exerted a negative impact on growth. 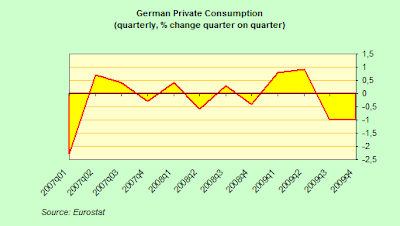 Final private consumption expenditure fell by 1.0% shaving 0.6 percentage points from headline GDP growth. 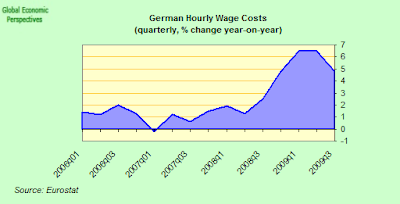 Interestingly German wage rates rose (see chart below) in the second half of 2009 (although due to significant quantities of short time working, gross wages were more or less stationary), but even this seems surge to have had little in the way of positive impact on consumption. Gross fixed capital formation fell back, and was down by 0.5% (spending on machinery and equipment fell by 1.5%). 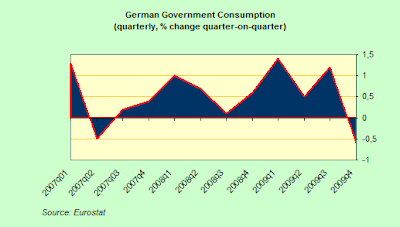 In addition the German government started to rein in spending (after many quarters of significant support) following the election, and government final consumption expenditure fell by 0.6%. In fact however, the biggest drop in domestic demand did not come from household spending, or from fixed capital investment, or from government consumption: it came from movement in inventories. Inventories were cut back sharply again during the quarter, and made a negative contribution to growth of 1.2 percentage points (out of the 2 percentage point negative contribution from domestic demand as a whole). This drop followed a considerable increase in inventories in the third quarter, wherby they contributed 1.5 percentage to growth. Now, I think I am begining to discern a pattern in these large swings in trade and inventories which characterise German GDP movements. Basically, it is important to keep in mind the East European component in German manufacturing (Hans Werner Sinn's Bazaar - not bizarre - economy idea). 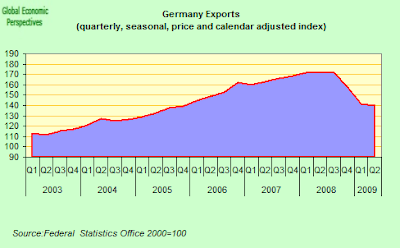 Basically a significant part of German exports are assembled products put together from materials manufactured in the East (a process which Delia Marin suggestively calls Maquilladores in reverse), and thus there may well be a correlation between high imports in one quarter (based on anticipated demand) and rising inventories (and falling imports) in the subsequent one as demand expectations systematically fail to be achieved (the excessive business expectations factor). Let's see. 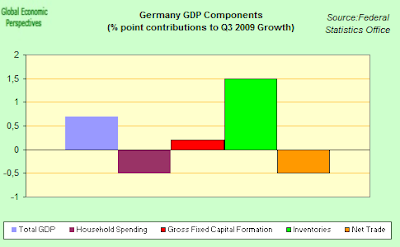 Below you will find three charts summarising movements in the key components of German GDP during the last three quarters of 2009. In Q2, as you will see, trade is up (as exports rise much faster than imports), while inventories are down, as accumulated stocks are exported. The in Q3 we see the opposite phenomenon, as inventories pile up, as imports surge without the expected growth in exports. Then finally we have Q4, and the opposite happens again, imports fall, exports rise, net trade is a growth positive, and inventories are cut back. 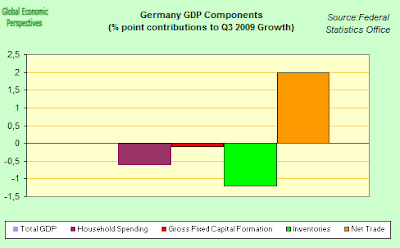 In each case the other components of growth are rather insignificant, and have in fact weakened as the recession has progressed - I hope this is not what Axel Weber means by saying that the German economy has survived the recession "intact" (namely that it is as export dependent now as ever it was). Well, this is only a hypothesis. 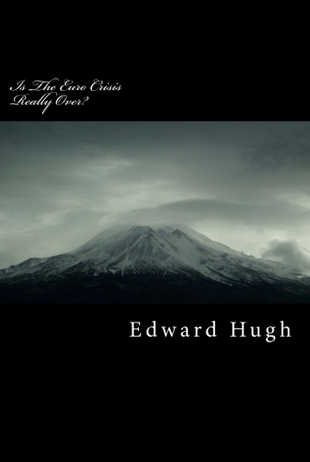 But if the hypothesis has any validity we should be able to make some predictions on the basis of it. I would make two. Firstly, since East Europe's economies are often dependent for their growth on exports to the West, and in particular to Germany, then we should be able to see some "shadow" of this German process cast out into the East. 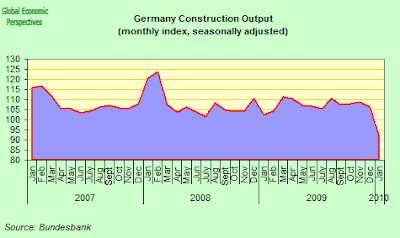 In the second place, we should see the process continue to some extent in Q1 2010. That is, based on what we have seen so far, in Q1 imports should rise, as industrial output in the early parts of the supply chain surges, and net trade should as a consequence be less positive than in Q4 2009. On the other hand, all the imported components awaiting processing should make inventories rise. So that's a prediction. Now we need to wait and see how good it is. 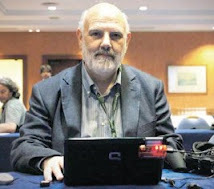 But on the upstream componenents, maybe we can learn something from the East. 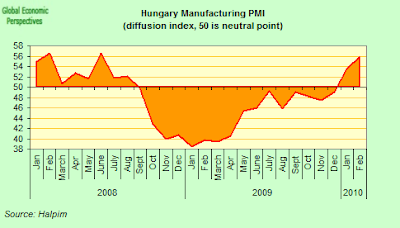 Let's start with Hungary, which has Germany as its largest single customer, and the manufacturing Purchasing Manager's Index (PMI). Well, basically if we think about the fact that German inventories were run down in Q4 last year, and imports slumped, then it is interesting to note that Hungarian manufacturing, after improving steadily during the earlier part of the year (barring August), slumped back again in the three months from October to December. 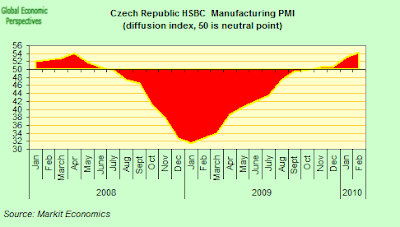 If we also look at Czech industry, a similar sort of picture emerges - stagnation in Q4 2009, and a surge in activity in this quarter. When we come to Poland things are rather different, since the Polish economy have vibrant autonomous demand, so the Polish industrial sector has local market growth to give some impetus, but things did taper off a bit in Q4, and they have now rebounded. So What Does "Intact" Really Mean In The German Case? 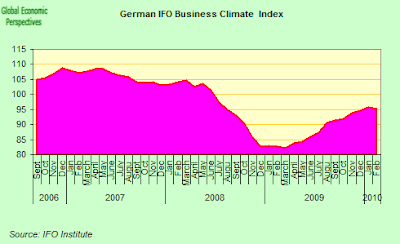 So, to come back to Axel Weber's point, I fear intact does mean "business as usual". Certainly, if we look at the most recent manufacturing PMI, the pace of expansion has improved slightly over the previous quarter, which may mean that those good old inventories are simply piling up again. While the services element has, if anything, lost momentum over Q4. And the February construction PMI looks even worse, with the indicator showing the worst decline in activity since the survey was introduced in September 1999. Poor weather conditions continued to have a negative impact upon the construction sector in February. Anecdotal evidence pointed to widespread weather disruptions, alongside relatively weak underlying demand. As a result, the headline seasonally adjusted Construction Purchasing Managers’ Index – a single-figure snapshot of overall activity in the construction economy – fell sharply from 40.2 in January to 28.9 in February. This was the lowest reading in the survey’s ten-and-a-half year history. Retail sales have been in serial decline since the VAT increase in January 2007. And the February retail PMI showed another sharp contraction, although again, weather conditions do seem to have played a part. 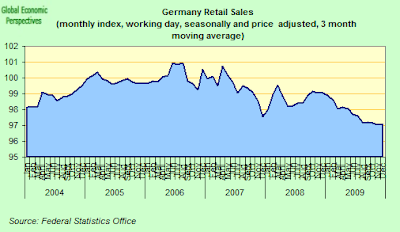 Retail sales in Germany declined sharply on a month-on-month basis in February. 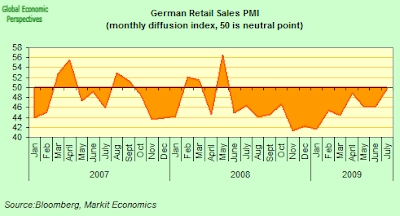 At 42.1, down from 42.7 in January, the seasonally adjusted Retail PMI was below the 50.0 no-change threshold, continuing the trend observed since June 2008.The latest reading pointed to the sharpest rate of contraction since January 2009, which survey respondents linked to a combination of bad weather and unfavourable economic conditions. A post-scrappage scheme downturn in demand for new cars was also cited by those in the automobiles sector. 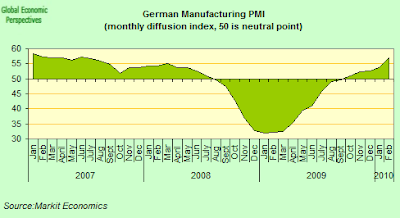 So, to conclude where we started, we can well agree with Axel Weber that the German economy is indeed intact - intact and near stationary. 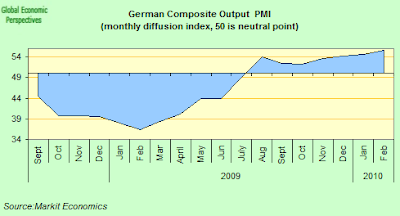 If we look at the composite PMI below (which is the nearest thing we have to a GDP indicator), it does show slight improvement over Q4 2009, but only a very slight one. 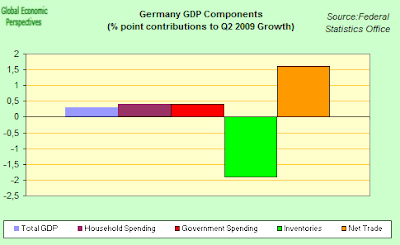 Given everything I have said above about swings in imports and inventories, I would say German GDP will be very near to stationary again this quarter, with a possible slight upside depending on the inventory swing, but whatever upside we do see will more than likely disappear as quickly as it came when we get to the Q2 2010 data. 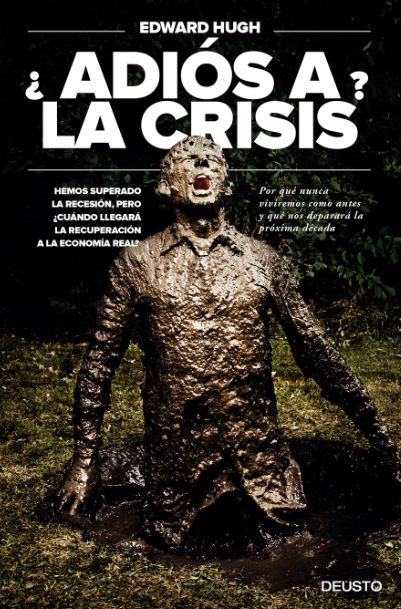 Why Not Unravel The IMF Too While We're At It? Just What Is Going On In Sweden?